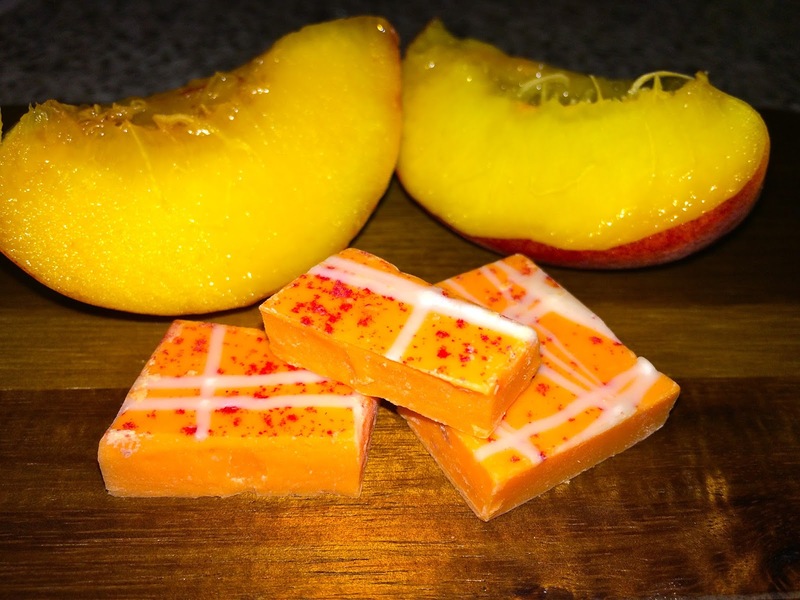 The Candy Quest: Do you like peaches? Or raspberries? Or heavily veiled insults? Do you like peaches? Or raspberries? Or heavily veiled insults? When was the last time you had peach melba? That peach/raspberry dessert combo popular with the over 70 set. Has it been awhile? Did you forget it even exists? I did too. While I was in Chicago, I happened to wander into a Fannie May store (I promise this is my last Chicago post) and saw a unique take on the classic peach melba. They made a peach/white chocolate bark and added bits of raspberry and "white stringing" (which I guess is FM speak for white chocolate taste) to it. 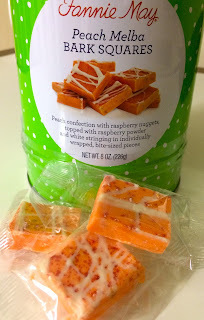 Kind of a new candy-take on a classic combination. I bought some to try and will get to that in a second because the real story here is the woman who happened to be working in the store that day. Coming from New York, a visit to the midwest always involves several I-can't-believe-how-nice-they-are-here moments. Kind of like that episode of the Simpson's when Homer abuses the Amish because "I can be a jerk and no one stops me". So you can imagine my surprise when I walked into the store and encountered a somewhat gruff, matter-of-fact employee. She was very much "hello, welcome to Fannie May, how may I help you?" but I could read her face and feel her judging me when I turned down a free sample and then looked around the store for awhile before trying or buying anything. She went about her work and answered my questions very factually but with heavily veiled insults to my intelligence. An example: "Do you have these in a smaller bag?" "No we're sold out." "So there are none in the back?" "We are sold out meaning that there are none left, if we had any left they would be out on display." When this exchange went down I kind of thought "Wait, am I picking up what I think I'm picking up here? In Chicago? Noooooo, she's just being matter-of-fact." Then a few other exchanges took place and a few more "can I help you's?" which really meant "have-you-freaking-decided-what-you-want-yet?" when I realized that she was definitely insulting my intelligence and I was IMPRESSED. I was impressed with her style and way of insulting me without actually ever insulting me. It was her tone and her way of answering my questions with extremely factual statements, kind patronizing but without the patronizing delivery. If anyone called her out on it, she could have easily defended herself by saying that she was just answering my questions. Which was totally true. But it was the WAY she answered them, her tone and delivery, that were truly the work of a master. I had to admire her. As a former waitress, I know it can be maddening to work with the general public. You cannot believe the stupid questions people ask. And yes, there are stupid questions. So rather than being insulted or put off by this woman, I marveled. What a rare gem to find in Chicago! The icing on the cake (white stringing on top??) was when I finally paid for the peach melba bark with my credit card and had to dash out the door. I waived off the receipt as it was printing saying "oh I don't need the receipt, it's fine" forgetting that whether or not you need to sign for a credit card purchase is up to the store and their particular minimum. So as I'm dashing and assuming she says loudly (for the entire line to hear) "yes you do need your receipt, because you need to sign it, because you paid by credit card". Ah yes, bravo gruff woman, bravo. So back to the peach melba bark. I wanted to try it for you because it's new and I'm a sucker for peach flavored anything. In truth, it doesn't have that juicy peach flavor that you would expect. It's more of a white chocolate flavored peach candy with bits of raspberry in it. Not super peachy but still good. I will warn you though, it's on the sweet side so one of these little squares at a time are all you need. And yes I styled the candy for these shots because why not? Food gets styled all the time, why can't candy? My recommendation for this candy if you buy it, would be to put it out on a night when you're just doing fruit for dessert. It's perfect for summer when people tend to have fruit or berries with whipped cream for dessert and maybe want a little something to go with it. 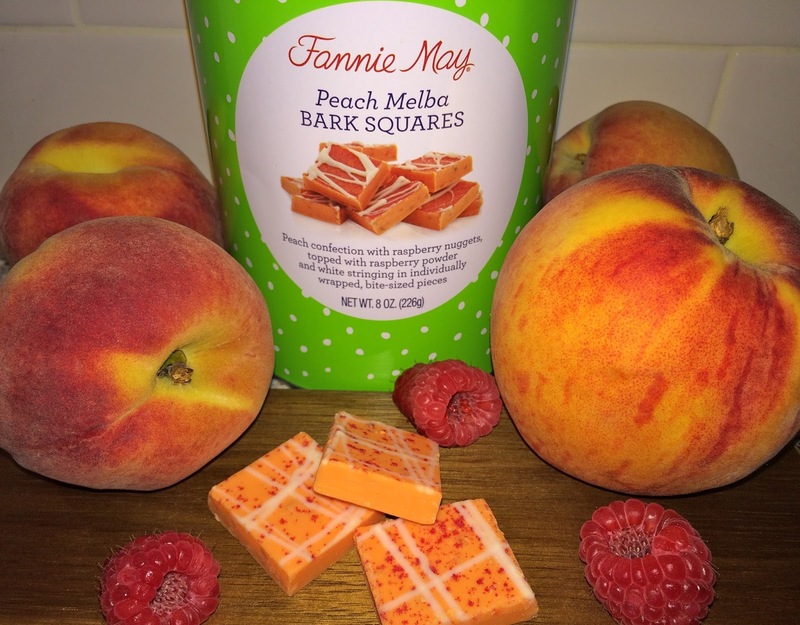 If you are lucky enough to visit the Fannie May store on N. Michigan Ave. in Chicago then you can pick up some of this peach melba candy and HOPEFULLY encounter my hero. If not, you can buy it from their website along with a whole bunch of other really good chocolate options. And Fannie May execs's, if you're reading this, please don't reprimand this employee, she is one of the reasons I will return to your store.